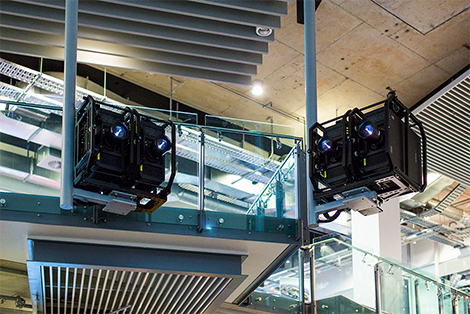 High 12,000 lm of brightness laser projector provide the immersive and detailed images required by the University to enhance the learning experience and deliver research outcomes. Up to 20,000 hours maintenance-free operation and long-lasting reliability support prolonged stable operation. Laser light source 3-chip DLP・projector with 4K+ resolution. QUT is a highly successful Australian university with an applied emphasis in courses and research. 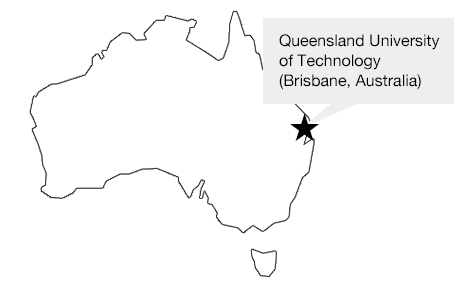 While QUT is based in Brisbane, Queensland, QUT have a global outlook. 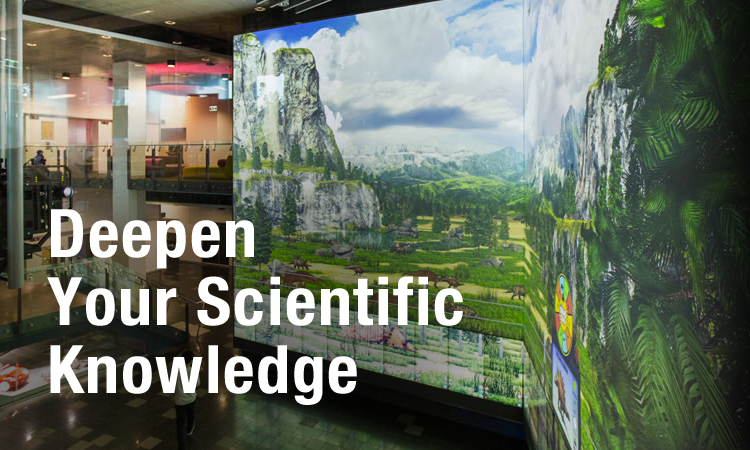 The Forum is a specialist facility designed to host collaborative forums with and between scientists, business and government as well as community workshops, and professional education programs. 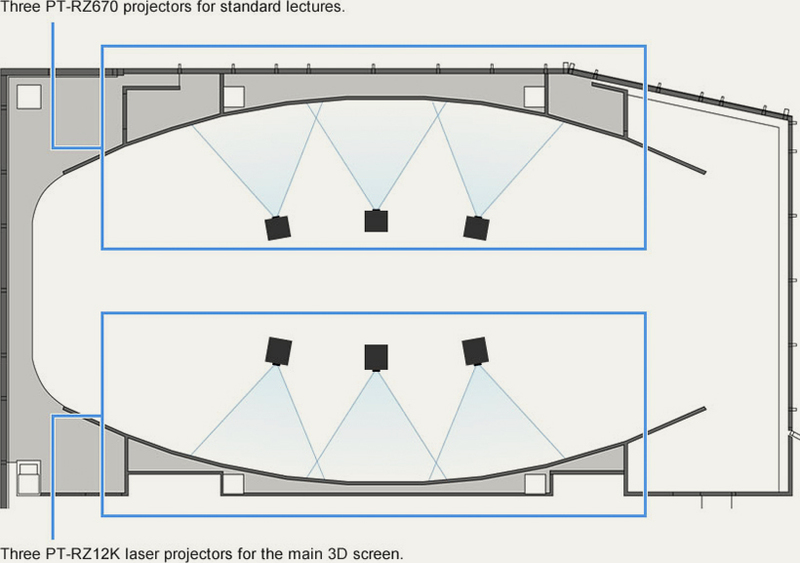 The 12,000 lumen PT-RZ12K laser projectors selected for The Forum are the brightest laser models available on the market, and provide the immersive and detailed images required by the University to enhance the learning experience and deliver better research outcomes. Professor Drogemuller said the buildings were being laser scanned in the field, a process which may require up to 50 scans per building. The scans are stitched together to provide a highly detailed image of a structure. create a seamless 3D image. 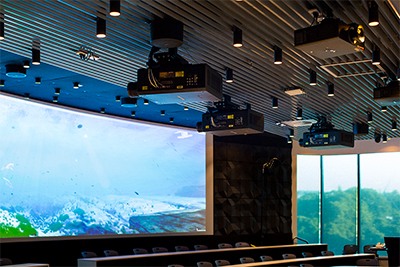 With the Forum originally equipped with six PT-DZ6710 projectors, QUT, under leadership by the Visualisation and eResearch group (ViseR), recognised that the room could realise greater potential as a high-end visualisation and collaboration space through upgraded projection technology. QUT embarked on an evaluation of laser projectors and concluded that the Panasonic PT-RZ12K laser projector was the best in its class. 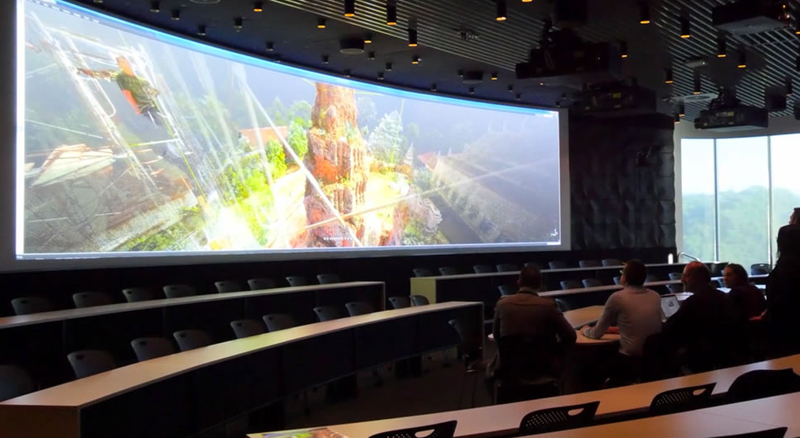 Three PT-RZ12Ks, coupled with high-performance graphics computers and an integrated congress microphone system, now provide stunning imaging including 3-channel stereoscopic (3D) projections to groups of 20-100 people. 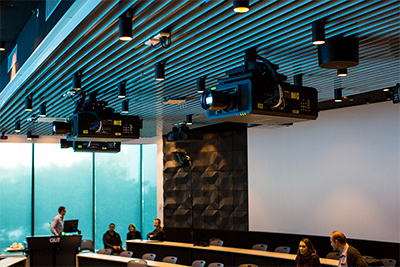 The solution was provided by national audio visual systems integrator, ProAV Solutions QLD, and will support the needs of the University members, partners, and the public for some years to come. 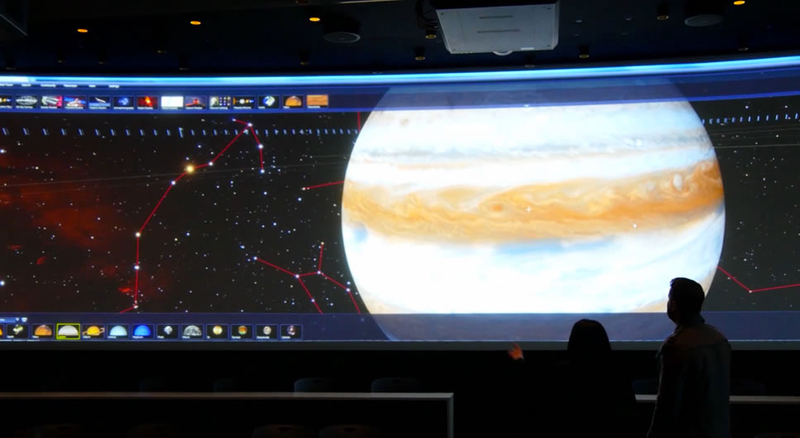 The combination of 12,000 lumen output and high resolution plus support for 3D makes the projectors ideal for simulation, interactive exhibitions or virtual reality. Panasonic’s PT-RZ12K edge blending feature is designed for easy setup and enables seamless conversion of multiple projected images. 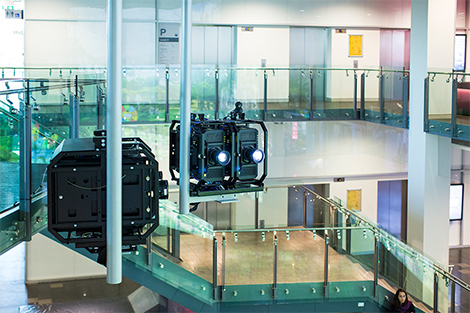 Three PT-RZ12K projectors create a seamless 3D image. The Forum is a unique facility, complementing the hugely successful Cube. 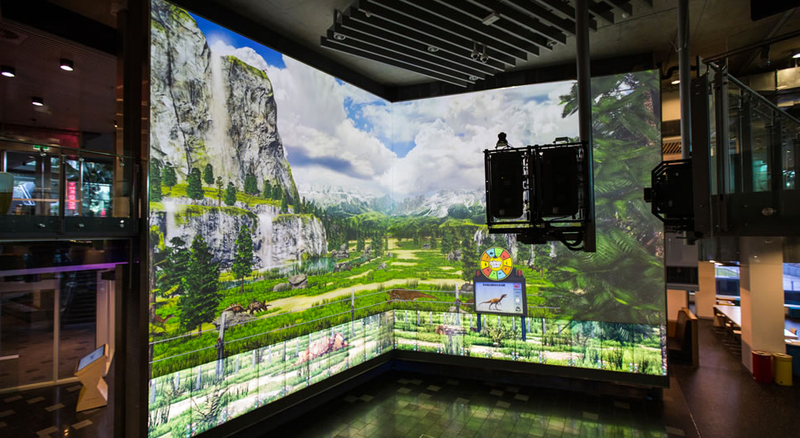 The Cube was recently upgraded with a fleet of PT-RZ670 projectors, and now features four Panasonic PT-RQ13K 4K laser systems ・sustaining one of the world’s largest digital interactive learning spaces. 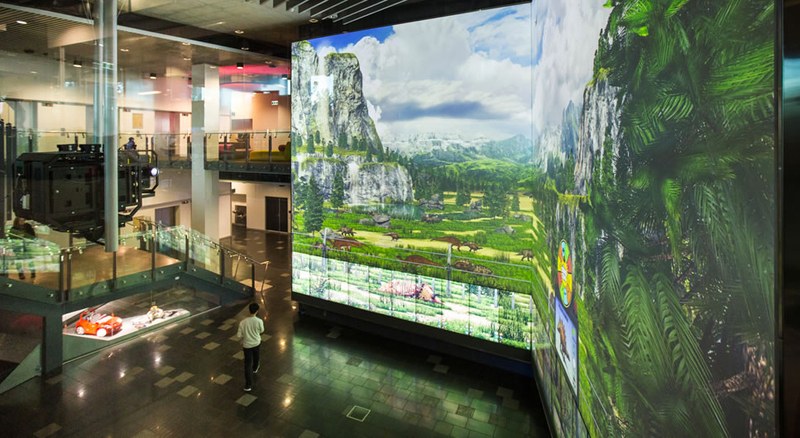 The Cube soars across two storeys - including an enormous 14 x 9 metre wall displaying a vibrant blended projection, and 48 multi-touch screens ・and is designed to provide an inspiring experience that allows the public, and particularly young people, to visualise, experience and explore QUT's Science and Engineering research. Thanks to the realism of the images, environments from intricate underwater landscapes to outer space can be replicated at a real-world scale. 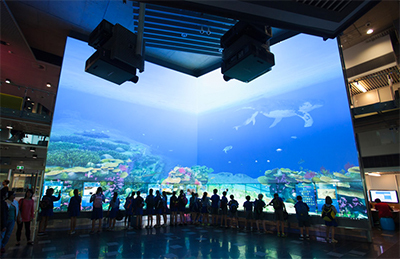 The selection of laser projectors is also in line with QUT’s ongoing shift from lamp-based projection to laser technology, reducing ongoing maintenance requirements associated with traditional lamp based projection solutions, where lamp replacements must be scheduled every 2,000 hours. In comparison, Panasonic’s PT-RZ12K projector is designed to be maintenance free for up to 20,000 hours. 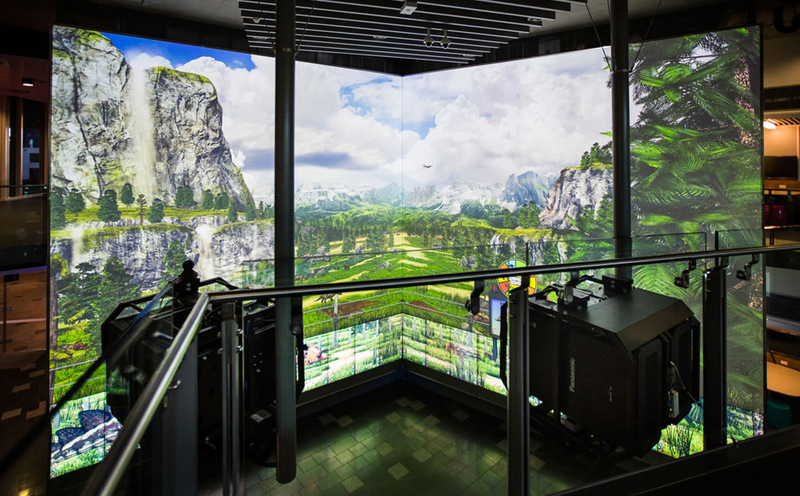 Providing a truly innovative learning experience, the brand new Science and Engineering Centre at Queensland University of Technology created “The CUBE”｛ne of the world’s largest digital interactive learning and display spaces which used many Panasonic projectors.t For more information, please see "Queensland University of Technology (QUT)" page.